A writer of academic mysteries? Moi? On the contrary, I have spent twenty-one years avoiding writing academic mysteries, and such self-denial ought to be saluted. After all, I taught in universities for twenty-two years, from 1961 to 1983. I can think of no other mystery writer who was by profession an academic who has shown a similar restraint. Why? Because of course academia shows such a high concentration of eminently murderable and murderous people. Passions, jealousies, pettinesses raised to issues of principle, sexual intrigue of all imaginable kinds — all these flourish in the hothouse atmosphere of a profession where until recently, you in effect had a job for life and you had to be either mad, incurably drunk or behind bars before there was some slight chance of your being pensioned off out of the reach of the impressionable young. As you can see, I like to take a balanced view. It may be too, that characters whom I had met in the course of my life as a university teacher did get into the books, usually as someone else. One of the singers in my Death on the High C’s was based on a librarian I had known in a perfectly dreadful university library, and perhaps on reflection a comparison could be drawn between an opera company and a university department. Every one of the latter has its prima donna, and if it is really unlucky, its three tenors. Yes, if you take the main characteristics of the human players in a university environment to be touchiness about position and prestige, jealousy about encroachment on research territory, an obsession with rank as extreme as might exist in a Balkan royal family, and sheer bloody quarrelsomeness, then many of my characters must have had traces of people I have mingled with, people I have listened to at departmental and faculty meetings, people I have fled from across snow-bound campuses. 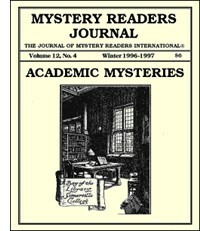 I suppose I ought to come clean now and admit that once I did indulge—that twenty-three years ago, on my first fictional outing into print, I did write what is undoubtedly an academic mystery Death of an Old Goat, 1974. I had had my first crime novel rejected by Britain’s foremost crime publisher, but so kindly rejected I just had to sit down and have a go at a second. Australia, was my first thought. They yell like stuck pigs when people slag off the country in print, but they really love it. And if Australia, it had to be academia: I had only been there five years, and university life was all I knew about. I must confess that there was some use in this book of real individuals, including self (if I am real—I’m never entirely sure) as the unofficial detective, raw, incipiently alcoholic, and just out from The Old Country. When using other characters, thought, I would always contend that as soon as you involve a character in a plot he changes by necessity from the real-life model, so that the model can only provide a starting-point, a sketch that will be painted in in a manner very different from the live model. That these characters tended to be no-hopers was dictated by the sort of novel I was intending to write—acerbic, chaotic, dismissive. My colleagues at my Australian university were certainly not all as hopeless as their equivalents in my book. Some, of course, were infinitely more so. You always have to soften down real life to make it acceptable. When my editor said that some of it was exaggerated I asked her to name episodes that seemed so to her. All the episodes she named were drawn directly from real life at the University of New England. I wrote the book in three stages, juggling with it and a doctorate, and never quite sure until well into it who had done the dirty deed (the murder of a visiting professor, based on the visit to my university of the distinguished critic Mario Praz) or why. I sent it off, waited, and quite soon got back two closely typed pages, with at the end the magic words “I am minded to accept this.” One of the happiest days of my life, complemented when I went over to England for publication, and on a journey to see a friend in Kent, read in the Observer one of Maurice Richardson’s thumbnail reviews, extremely enthusiastic. It’s a book I think I will still like if I ever have to reread it (presumably in my dotage, when I am past creation). I didn’t bring off the end, which was to have been a surprise in the last line, but a lot of the rest hit its mark, I think. I am told that the Vice-Chancellor at U.N.E. said publicly I should be horsewhipped. I don’t think I’ve ever had a greater compliment. One of the combatants was Dombey Dell, chairman of the English department… As Owen watched in astonishment, Dombey landed a punch in the other man’s solar plexus, then lost his balance and catapulted into Winifred Gaw’s big potted plant. “Ooof,” said the other man, swinging wildly at empty air. It was Owen’s old friend from Concord, Homer Kelly, distinguished Thoreau scholar and professor of American literature… Homer was throwing his long arms around Dombey Dell in a bear hug and hanging on with all his strength. Violence among the educated classes? Of course. For a real life example. take the case of John Webster, respected physician, Harvard class of 1811. Webster owed money to his colleague on the faculty of the Harvard Medical School, George Parkman. One day Webster was driven mad by Parkman’s insolent public demands, and he struck him a violent blow. When Parkman fell dead, Webster was horrified, but he quickly disposed of the body by cutting it up in neat chunks and dropping the pieces into the furnace beneath his laboratory. The he went home and had tea with his wife and family. All would have been well if a handyman had not found Parkman’s bones in the furnace and raised the alarm. Webster was convicted of murder and hung in 1850. But what a comfort that good doctor has been to me, justifying a host of criminal acts by the polite people in my suspense novels! Following his dignified example they never hesitate to push other characters off balconies, or blow them up, or set them on fire, or dismember them ruthlessly with axes. And it isn’t only Dr. Webster’s kind of dismemberment that is practiced by the intelligentsia. Hacking scholarly reputations to pieces in public print is another kind of murder. Imagine an eminent entomologist, after five years of peering at cross-sections of earwigs through a microscope and publishing his findings at last, who is torn limb from limb in a prestigious journal by a jealous competitor. The distinguished Chair of Entomology at the university may not come his way after all, his reputation has been torn asunder, his fellow researchers all over the world are snickering. Doesn’t it call for revenge? Retaliation? Justice? A righteous act of homicide? But forget about murders and murderers and motivations and investigations. For me the best thing about academic mysteries has been the opportunity to play with some of the finest things in the world and draw pictures of wonderful places—Amherst and Emily Dickinson’s poetry (crammed into that book on every page), Harvard’s Memorial Hall and Handel’s Messiah (every chapter of that one had a musical epigraph), the Gardner Museum and its works of art (this was a chance to draw marvelous things), Henry Thoreau’s Journal (for a host of pithy fragments), the city of Florence (for Dante’s Divine Comedy), Boston’s Back Bay (for organ pipes and sewer pipes), and the Oxford University Museum (for The Origin of Species and Alice in Wonderland). I’m looking around now for other superb places to write about, other marvels of art or science or literature to trample on for a while, other churches or museums or institutions of higher learning to functionally disrupt, other curators or clergy or college dignitaries to send to their last reward. There are plenty to chose from. The Accademia in Venice? St. Peter’s in Rome? The Cathedral of Chartres? Middlesex County Polytechnic? Lincoln-Sudbury Regional High School? They all sound great. I can hardly wait to get going again.